Located in the vicinity of the National West Creek Wetland Park, this corporate tower envisages a fun, interactive and sustainable work environment along Mount Tianmu. The masterplan extends the architectural language onto its landscape with a seamless spatial in-between condition at the void decks, squares and courtyards around the site. It continues the verticality of its facade design metaphor of a ‘bamboo forest’ and respond to the sloped terrain by interweaving a series of terraces with local vegetation acting as a buffer to create a natural and quiet oasis. 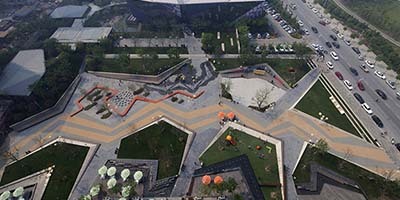 An integrated pedestrian network links together different activity nodes to extend the office interiors into the outdoors.